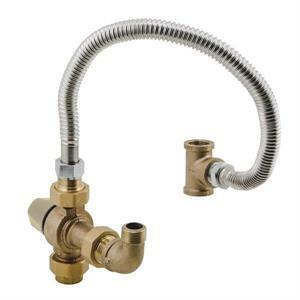 Watts LFMMV-HTK Hot Water Tank Capacity Extender - 3/4"
LFMMV-HTK hot water tank capacity extender increases hot water capacity by as much as 133%, depending on storage and hot water flow. It maintains and limits mixed hot water to a desired, selectable temperature and allows the hot water tank to be set at a higher temperature to minimize the occurrence of Legionella and other water-borne bacteria. The LFMMV-HTK can be set to any temperature between 80° and 120° with the flow rate as low as 0.5 gpm and as high as 13 gpm. The thermostatic valve is listed to ASSE 1070, ASSE 1017 and IAPMO cUPC. The Series LFMMV-HTK mixing valve kit installs on a hot water tank to increase hot water capacity by providing greater control over water temperature and flow.